The thought that matter is divisible has both intuitive appeal and empirical justification, and is a widespread position amongst ancient and modern philosophers. The thought that matter is unlimitedly divisible on the other hand has intuitive appeal, but not empirical justification, which is why there are only few philosophers upholding this view; for instance, Aristotle. But the thought that matter is unlimitedly divided is neither intuitive nor empirically justifiable, and has been very rarely endorsed in the history of metaphysics; Leibniz is one of the few exceptions. Yet, unlimited division is the keystone of two ancient metaphysical systems that in many other respects are different from one another: Anaxagoras’s and the Stoics.’ My view is that both Anaxagoras and the Stoics posited an unlimitedly divided bedrock of reality, and that they took this stance for metaphysical reasons, i.e. because this assumption does explanatory work that would have otherwise been left undone in their systems. This explanatory work includes, but is not limited to, the constitution of material objects, change, and causation. 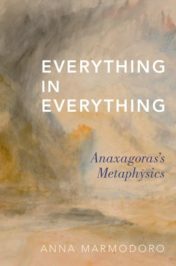 A novel interpretation is needed of the puzzling and yet pivotal claim Anaxagoras makes, that there is a share of everything in everything. Anaxagoras takes this stance as a solution to Parmenides’ puzzle of change that vetoes that what is can come from what is not. The thrust of Anaxagoras’ reply to Parmenides is that anything can come out of anything because it was already in it. But how can everything be in everything? The majority view among scholars is that Anaxagoras dictum was intended to express a relation of containment, such that every thing there is contains in its make-up all the basic elements of reality as the ingredients which constitute it. I believe in motivating a departure from this received interpretation of Anaxagoras, which has already been shown in the literature to be prey to many difficulties. Anaxagoras solves the puzzle of change by conceiving the basic elements of his ontology as being everywhere (rather that as being in everything). The elements can be everywhere because they are unlimitedly divided. This is the key metaphysical move that Anaxagoras makes. Ultimately in his system there is no region of space, no matter how small, that lacks any of the basic elements, which by recombination make up things. But if the elements are everywhere, i.e. at every spatio-temporal location, they are coextensive with each other. This is facilitated on my interpretation by their unlimited division: being unlimitedly divided, they are neither atomic (for they would not be unlimitedly divided), nor lack extension (for they would be indivisible); rather, they converge on zero extension, and can thus be colocated in space. For Anaxagoras what is coextended are physical powers, the so called ‘opposites’, that compose stuff, by colocation. Thus Anaxagoras is not only the first ante litteram gunk lover in the history of metaphysics; he also puts forward an entirely new conception of gunk, where what is unlimitedly divided is not matter (like Leibniz for instance thought and Lewis coined the technical expression “gunk” for), but rather, are instances of physical powers. Gunk as you never knew it! Featured image credit: Black smoke by Tookapic. Public domain via Pexels. Anna Marmodoro is an Official Fellow in Philosophy at Corpus Christi College, University of Oxford. She specializes in ancient philosophy and contemporary metaphysics, with research interests also in medieval philosophy, the philosophy of mind and the philosophy of religion. Her publications span all these areas. She is the author of Everything in Everything: Anaxagoras's Metaphysics. So is this by or about Anna Marmodoro? Wow! Congrats on getting some editorial attention to my comment. It seems to have done the trick for the wording of this page!